FINISHING WORKS ONLY BEGINS AFTER YOU PICK OUT YOUR PIECE. 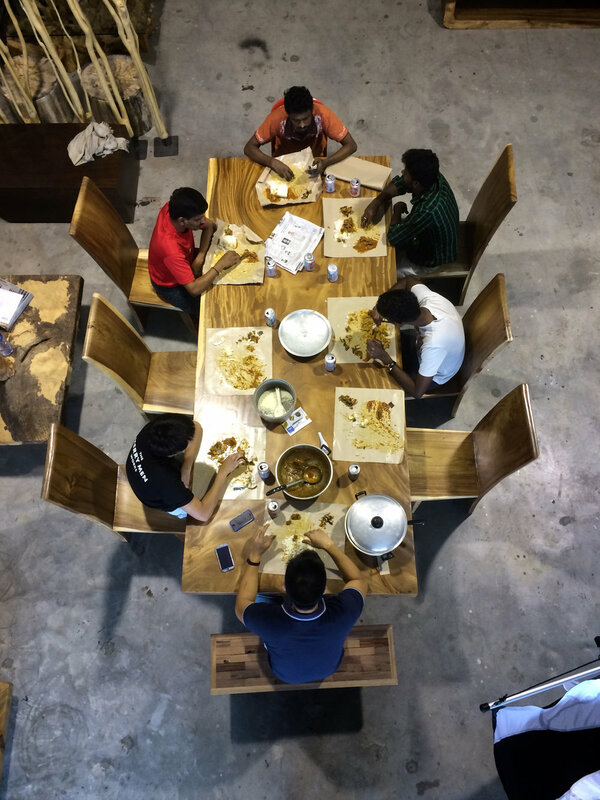 EVERY HERMAN TABLE IS A MARK OF QUALITY WITH OUR TOTAL CONTROL THROUGHOUT THE ENTIRE PROCESS. Be part of this process. Sometimes, the best designer is yourself, many of Herman Furniture's pieces are designed by the customers themselves. Being a furniture house that provides highly customizable pieces, we can personalise your furniture almost as far as your imagination can stretch. Other times, our wood experts at Herman Furniture can advise you on how to achieve the perfect wooden furniture that you have been searching high and low for. Picking out the ideal piece of solid wood table top is just the first step in buying your solid wood dining table at Herman Furniture. From then on, the type of legs that you choose to match with your solid wood table top determines the kind of look that your dining table will eventually have. Possibilities to designing your designer dining table is endless: Modern Design - Solid suar wood top finished in a glossy topcoat, paired with a polished stainless steel legs. Industrial Design - Freeform Tamarind wood top finished in a matt topcoat and paired with a hairline finish stainless steel legs. Or Classic Design - Live-edge suar wood top finished in a matt topcoat paired with black powder-coated legs. We also specialise in many other types of raw wood pieces, such as tree stumps, log benches, log stools, raw wood decorative pieces, and wooden art sculptures. These pieces are all one-of-a-kind as well, nearly impossible to replicate.